A popular holiday destination, it may or may not surprise you to learn the Port Douglas is also a favourite destination among golfers. Aside from the fantastic tropical climate and almost year round sunshine, there are also a number of 18-hole international standard championship golf courses that help to rank Port Douglas golf as some of the best in the world. With spectacular views from many of the local courses, the grass is always green when it comes to Port Douglas golf which caters for everyone from beginners to experienced golfers. There are three main Port Douglas golf courses including the Mirage Country Club, Palmer Sea Reef Golf Club and Mossman Golf Club. Located within minutes of the centre of town you’ll always be close to a great course regardless of where you stay, however some golf courses even feature onsite accommodation for those who want to be close to the action. Located on Port Douglas Road, Port Douglas Mirage Country Club is an absolute golfing paradise featuring an 18-hole international standard championship course rated among the best resort courses in the world. Boasting an aquatic driving range with spectacular views of the mountains and Coral Sea, the course was designed by famous golf architect Peter Thompson and offers a combination of six par 3, six par 4 and six par 5 holes with two rather different nines. Located at the Sheraton Mirage Port Douglas. 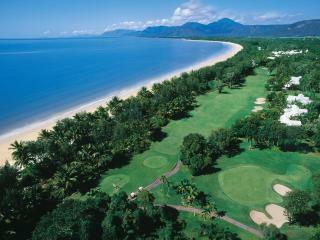 Located on Old Port Road, Palmer Sea Reef Golf Club has a highly esteemed reputation when it comes to Port Douglas golf. Ranked among the top 100 courses in Australia, it is also the only tropical links-style course in Australia. Maintained to championship standard year round, the 6km course offers 3 different teeing grounds, wide rolling fairways, 89 bunkers and expansive greens complete with mounds and swales. The Mossman Golf Club on Newell Beach Road is just 20 minutes south of Port Douglas and offers a relaxing and friendly place to tee off. Surrounded by the Daintree Rainforest, this affordable course is renowned for its fantastic views and is popular with locals and visitors alike.